Kenya Confidential is part of Global movement raising awareness against Corruption, which we believe is the root cause of Social Evils driven by insatiable personal Greed for Wealth and Power. Any system founded on Greed for personal aggrandizement leads to Bad Governance and flawed Corporate Management. 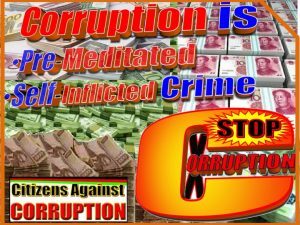 Corruption has been the greatest impediment to National and Global prosperity that stagnates socio-economic development, promotes crime and inequalities in many countries where massive poverty, unemployment and diseases ravage ignorant populations as the order of the day. Kenya Confidential will carry #CitizensAgainstGraft, #CitizensAgainstCorruption banner to the bitter end and support #EconomicFreedomFighters War on Corruption and Bad Governance. We discuss, provide coverage and analyze issues Frankly, Fearless and without Favour. Kenya Confidential has no room for the Corrupt, Ethnic Hate Mongers and those who seek to destroy the well-being of our beloved Motherland and her citizens of all shades of tribes, races, religious or political affiliations. No one was born a Tribalist, Racist, Corrupt or Evil – those are self-driven self-inflicted acquisitions one can say NO to and live and let live happily in this world. Kenya Confidential firmly advocates and subscribes to Democratic Rule of Law and pursuit of good Governance founded on the adherence to Constitutional instruments as the Supreme Law. Advertising will not be allowed to influence Kenya Confidential editorial policy whatsoever. Thank you for the privilege of your company. Welcome aboard – Editor-in-Chief/Publisher Blamuel Njururi.